In the past few years, preservation work at the Pope-Leighey House has been focused on the exterior cypress. A pilot conservation program was recently completed that studied the options for creating the best methodologies to clean and protect the exterior siding. Should the wood look weathered or should it be maintained to reflect how it looked when it was built? The original construction specifications treated the interior and exterior wood the same, creating a surface that looked continuous. Over the years, exposure to the weather has caused the softer early wood of the cypress to deteriorate more rapidly than the harder late wood. This creates a slightly uneven surface and UV exposure has also caused the cypress to gray. Experts reached a solution that cleans and protects the siding from biological growth and UV rays, yet some of the weathering will remain. Narrow wood Dutchman, small wood-grafts used to repair cracked and damaged wood, were also completed to provide a more stable exterior skin. The main mansion is a formal building of brick masonry, sandstone trim and regal window openings – eighty-six windows to be exact – and many of those window openings are larger than 4 feet wide by eight feet tall, creating quite an imposing façade. While the main block windows date to 1805, most of the hyphen and wing windows date to the early twentieth-century restoration. Amazingly, none of the windows had received much more than cyclical maintenance since they were installed. 2012, therefore, has been the year of the window campaign, as most of the windows were removed to a carpenter’s shop for full restoration. The exquisite craftsmanship and joinery of the original cypress windows held up well, and little new material was introduced during conservation. Windows on all sides of the house were removed, restored, and reinstalled. The shutters have also been restored and re-hung on the northwest elevation, which is the current public approach to the building. The original public approach was on the southeast side of the mansion. Much of the Aquia sandstone trim had predictably weathered, and the worst conditions were patched with mortar, rather than introducing replacement stones. To learn more about the window restoration project, read Restored Woodlawn Windows Ready for Another 100 Years by National Trust architect Ashley Wilson and Victorian Homes Magazine’s story on the project. 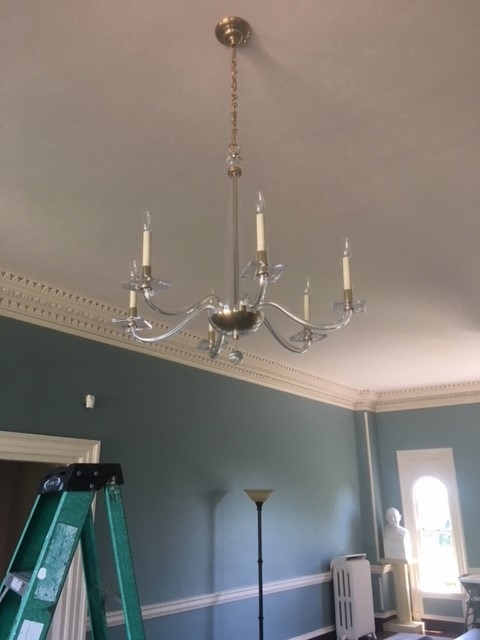 The Dairy, a small brick masonry dependency to the south of the mansion, will undergo a brick and mortar restoration, as will the site walls that connect the Dairy and the Smokehouse to the mansion. 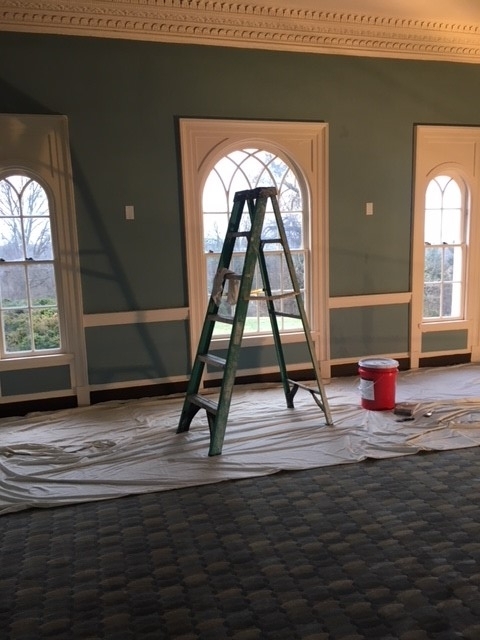 WITH A LOT OF PROFESSIONAL PRESERVATION HELP AND LOTS OF WORK, TWO MONTHS LATER, WALLS AND CEILING ARE NEW AGAIN AND REPAINTED, NEW CARPET IN! FINALLY, OPEN FOR BUSINESS AGAIN - EARLY SUMMER EVENING AND ALL IS WELL IN THE NEWLY RESTORED UNDERWOOD ROOM!